In the lifespan of every wood flooring comes a moment when it requires more than just the regular washing up and drying. Even the toughest hardwood floors need professional treatment and restoration at some point. With the floor sanding service in Enfield EN, your floors shed their imperfections and live on to serve your many more years. You can improve the appearance of your floors with just a single call at 020 3404 9697! 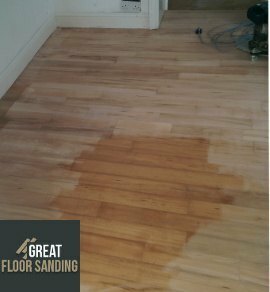 Repair and Restoration: We prepare the floor for the actual sanding process. Damaged boards are completely replaced. If some of them are loose, we secure them and we also pinch nails to them. Filling the Gaps: Sealing the gaps is important for many reasons. We use all organic materials. Staining: Staining is completely optional. We can easily change the hue of your floors if you want us to do it. Enfield Floor Sanding is the Right Choice for You! Years in the field of floor sanding in Enfield have strengthened the performance, and all members of the teams have been BONA certified – the greatest testament to the experience and capabilities. Your floors are in the safest hands with the latest equipment and high-grade organic materials for filling out the gaps and sealing your floor. You return to your property to even floors and no sign of sawdust in the process. Efficiency, quality, and cleanliness. This is what you order with us as your wood floor sanding company. Order Your Wood Floor Sanding with a Single Phone Call! Dial 020 3404 9697 to get in touch with one of our representatives and schedules in a viewing. Contact us at any time from Monday to Sunday even on holidays to receive further details on your requested service, edit the details of your viewing or inquire about special discounts. We’ve also got a chat facility and contact form right here on our website.